You did it! Holy cats! From the bottom of our hearts, we'd like to say THANK YOU to everyone who has backed us so far. If we weren't working our butts off on our new game, we'd be dancing around the Closet (our tiny office) with tears of joy streaming down our faces. Instead, the team is heads-down at their computers, sniffling loudly and wiping their eyes with their shirt-sleeves. In Jordan's video update below, he talks about things we could add to the game if we hit higher funding milestones. We're working on clarifying those milestones and will have an update for you before the weekend (in Seattle). Share the link to our Kickstarter page via Facebook, Google +, Twitter, Westeros Raven, whatever. Like the Harebrained Schemes Facebook page and start talking. Tweet and RT your love. Use #shadowrunreturns so we can all participate. As a fan of the pen-and-paper Shadowrun, I support Shadowrun Returns for the purely awesomeness that is Shadowrun. But I never played the SNES or Genesis versions of the game. 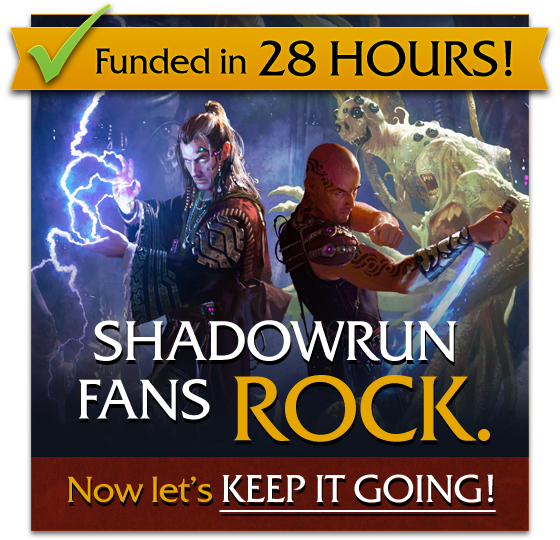 If Shadowrun Returns included versions of those games as missions, I would support more strongly the stretch goal of making a campaign to tie Shadowrun Returns into those games. I don't like the idea of this being Backer-only, though - it just feels like DLC. I've already reaped the incentives of being a Backer, IMHO, and would rather see the stretch goals be extended to all. I really don't care one way or the other too much, but I do think you should make the 1.5 mil missions available to everyone. Just my opinion, though. I just want to be able to play as Dwarves, Evles, Orcs, Trolls, etc as I don't want to only play as a human. I'd also like to see a few NPC's who are a little more offbeat in the their racial make-up. Maybe toss in a Centaur, Pixie or Cyclops NPC just for the sake of variety. Thanks for the update, fellas, and for rededicating yourselves to the single-player experience; I feel very strongly that's the right move. Denver would indeed be interesting, as would New Tokyo. San Francisco is relatively close (geographically speaking) and has all sorts of promise as well (occupied as it is by Imperial Japan, I believe). Another great option would be to flesh out a city or area in the NAN. the ability to run tabletop style games would be awesome. Dedicated servers to facilitate the exchange of player-created content between people, and enhancements to the level-editor tools that would allow for easier collaborative projects. Everyone wants their favorite city in the game – imagine groups from the same city putting their heads together and building their city for everyone across the world to enjoy! I’d rather have fleshed-out city building tools with my level-editor than another city. Give us a small, fictional sample city with demos and tutorials on how it was built up from scratch. Some people will just play through it, while others can go the extra mile or more with it. If we can’t have co-op in this iteration, then let’s try for the next best thing. ...And if these cities were backward compatible with the next iteration of Shadowrun *with* co-op, then that’d basically result in an instant, international Shadowrun world. I would personally enjoy co-op play as well.. In my mind, such a feature would really put it over the top and make me jump up and down like a giddy little school kid. I also hope down the line if you find this game successful you conciser making a sandbox style mmo of Shadowrun. Anyways,I'm glad i could have the opportunity to back you guys. You have had me hooked ever since the Sega Genesis game. I conciser myself a pretty dedicated gamer and of all the games I've played from then to now, that's still one of my faves. I'm hoping to see the same kind of "spark" in this. Not that that means I expect a 1:1 match between actual tabletop play possibilities and the video game, but by all the dragons and mentor spirits, it'd be nicer to work a run on that than over text chat with my internationally-scattered tabletop group. That also means I'd support adding riggers _first_. I'm increasing my pledge specifically for the possibility of Co-op. Combined with the level editor, if the game's mechanics support the character options from the RPG richly enough, we could move from "Shadowrun video game" to "Shadowrun virtual tabletop". I agree that co-op would be needed to truly have this see its full potential. I would suggest a "put me in NPC" mode that would allow you to still play as part of a team in coop. It would allow for a team of four to schedule not only gaming together, but play based on scheduling. e.g. "2 of us are out of pocket this week. How about we flip to NPC mode and you make the run on objective A. We'll team up again on Saturday as a group to pick up from there." How much to add co-op? Also, I don't see why adding co-op would affect the game negatively. The game is turn based, so you just have some humans taking turns. People who go afk could simply click a button that triggers an idle mode where an ar ai takes over temporarily and act as a support character (so many things you could do here). Missions/Quests can be done similarly to the many co-op games out there (d2, borderlands, saints row, etc). Co-op would simply be SP with more people and the game would scale accordingly. Me and my brother played this game a lot as kids and a 2 player co-op would be amazing. However, if co-op is to be implemented as a side game kind of deal then I would agree that it's a bad idea, just look at Rage, the co-op is boring and you have to play it to understand the legend behind it (that doesn't make any sense). I agree; co-op would be a nifty feature, but only as long as it doesn't impinge on the single-player experience. Co-op is a great idea.. pvp I agree isn't what I would be looking for in an ShadowRun game.. I just want a strong rewarding RPG experience, and if we hit a milestone that allows for really letting our gaming friends get together and playing ShadowRun together Co-Op ... then you'll be bringing the table together again.. and this will allow friends across thousands of miles and years get back together and do runs in the shadows..
Stay focus on the single player RPG experience like stated in your original kickstart speech please. I would LOVE coop, I'm sure I could bring a few more people into this for that. But PVP is not my deal at all, and we have seen other turn based coop titles work. I bet that 90% of the funding people of this project dont care about multiplayer, so please dont waste resources for this. Just focus on a great single player. @Josh Chestnut - The game that Jordan's pitching has nothing to do with recreating a tabletop game experience. That's something that all of us who played PnPs know simply cannot be recreated without a Game Master reacting on the fly to the insane things PCs do. There are hundreds of messages on the Wasteland 2 KS page and forums debating this back and forth. In the end, WL2 will be a single player game. Shadowrun Returns should also be limited to single player. Just remember what shadowrun players love. Last time i checked FPS arcade fanboys didnt help support the SR franchise. Also i like old school cyber punk. We all know that through todays modern technology and upcoming tech and medicine that 70% of SR is outdated. But to me old school cyber punk has so much more style. Please NO MULTIPLAYER! I want a great SINGLE PLAYER game with LOTS of customization! You say multiplayer is fluff, but want a re-creation of the tabletop experience? The tabletop experience is inherently multiplayer and including this feature is essential if they hope to simulate running the shadows with your chummers. I totally agree with Rick. Fans of the original Shadowrun RPG want the roleplay system the know and love and a great story in a single player campaign. Also, if I understand correctly, this title will be more aimed at the 'old school' gamer who played videogames before it was 'cool'. (turn based and 2D graphics is oldschool (which is good, don't get me wrong :) ). PvP and online multiplayer is like Rick said 'fluff'. A campaign editor so people can make their own story which other players can play is a more interesting extra so please focus on that. Assuming that it wasn't already part of the scope of the original plans, a FULL port of the Shadowrun character system would be the first thing I'd put on the table to pour resources into. All the races. All the archetypes, skills, equipment. And PLEASE pour as much resource as you can into making the magic and decking systems as true to the tabletop game as possible. All of my Shadowrun experience is from pre-4th edition, so would much prefer that version, but even making a 4th-edition faithful framework for all of these elements in the single player game would be of FAR greater priority than fluff like multiplayer or PvP. +1 for Daves comment. Story is more important. I'm 100% with Dave Talbert here. Just for the sake of completeness, let me go the other way and say that I would really prefer that multiplayer be accorded a lower priority than fleshing out the story in greater depth and complexity. Story/World > Multiplayer, in my opinion. I agree with Poppy. I see a lot of people requesting multiplayer or co-op. I think that would be an essential part of extending the pen-n-paper to the tablets. Not only is sharing stories by giving your scripts and campaigns to your friends important - my best memories are not the stories themselves but the experience of sharing it with friends playing through it together! I would love to see some LAN and internet multiplayer support. Maybe Game Master powers?! I loved this game from my old pen and paper days (and I was pledging before the video even finished playing) so I am particularly interested in being able to play co op with friends. If you do add co op, you can add another pledge from my husband along with any of my old gaming friends I can find. It would be damn good to be able to pick up where we left off 20 years ago! I am with the others on the no need for voice acting. I find it often gets in the way and if limits options for little benefit. So at a million are we getting some sweet voice acting? 700 maybe Bug City exspansion added? 800 and maybe Tokyo? 900 maybe add in Germany, Tir, and England, even the Desert Wars?? Definitely loving the idea of co-op stuff. Especially on a tablet. With the right sort of set up, though could take the place of the traditional PnP setup for the lazier of us out there in the world. Good luck! You guys need to do a longer roadmap as funding now is over 500.000 - Have a think about all the way to 3 million. Or even 5. Seriously. Would love to see something at the $150 price-point. If you're able to incorporate news-feeds or matrix feeds into the background, it'd be sweet to be able to submit 50 words or so to show up at random as supplemental content with the "real" posts. Just enough to make a reference to a favourite character or job from times past (whether one that went well, or one that went horribly wrong). Or maybe even a hook for an adventure sitting at the back of the GM's mind for future play. Obviously you guys would need final creative control and wouldn't want to spend a lot of time back-and-forth on edits, so maybe "submit 5, we'll pick one and edit as necessary to fit with feel & story-line". And if you wanted to use more than one of them for some reason, you'd have the IP rights to do so. It would give you lots of free flavour-filler, and maybe even a few plot ideas. And hopefully more cash. I know I'd pitch in an extra $50. Have at least some of the scenarios set up to require stealth and strategy. Would it be possible for the game to include the SNES and Genesis Shadowrun games as well, as Easter Eggs or something? Co-op play would be great! Shadowrun was my introduction to roleplaying games (well, technically BattleTech...but I never actually played the Mechwarrior RPG). I was 12 years old back in 1992 when I bought Shadowrun 2nd Edition. I wish I still had that book, but I re-re-re-re-read it so many times it literally fell apart. As did my second copy. And my copy of 3rd Edition is looking pretty ragged too. But I did a tally of all my RPG books. I have 6 D&D books, 1 Pathfinder book, 3 Battletech/Mechwarrior books, and 64 Shadowrun books (not counting the novels). I'm trilled to have been part of bringing the original creators back to the original universe I fell in love with and can't wait to see what you do with it. Now comes the hard part...waiting patiently for the awesome final product I know you folks are going to produce. Can't wait to play this!